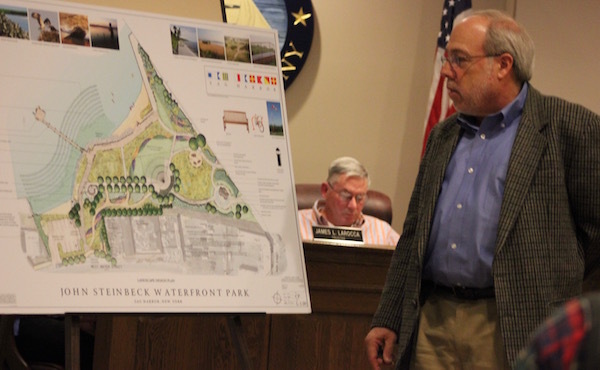 Ed Hollander unveiled plans for the park at Tuesday’s Sag Harbor Village Board meeting. 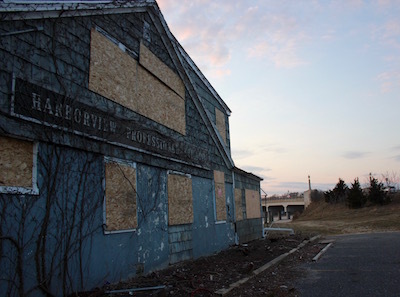 If you’ve driven over the Sag Harbor-North Haven bridge over the past couple years, you’ve probably noticed the boarded and graffitoed buildings that currently stand at the gateway to one of the most beautiful villages on the East End. The park would be here. Below the bridge is a crushed stone path, which you can follow over to picturesque Windmill Beach, near Long Wharf, where kids dip their feet in the water under their parents’ watchful eyes. There’s nothing picturesque on the other side of the bridge, where the three tax lots, totalling 1.7 acres, are filled with flotsam, pieces of fencing and the boarded buildings. The site has been mired in controversy for nearly a decade since condominiums were first proposed there. 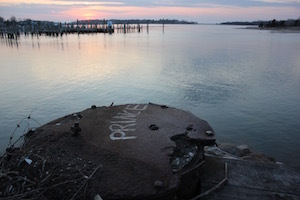 Last year, Southampton Town placed the property, now owned by East End Ventures, LLC, on its list of properties the town would like to acquire through the Community Preservation Fund, and in January, Sag Harbor Village hired attorney Saul Fenchel to advise them on the possibility of condemning the property. This Tuesday, the village unveiled a plan by landscape architect Ed Hollander to turn the property into a waterfront park. This would be part of the park. “It has been a pleasure working on this project for the village,” said Mr. Hollander, who unveiled a John Steinbeck Waterfront Park, to be named after the Nobel and Pulitzer prize-winning author who spent the later years of his life in Sag Harbor. His plans for the park include a bay scallop-themed bandshell, a Young Whalers playground, a weather station and charging station, a fishing pier, bird watching areas, rain gardens and native plants. It also includes a plan to replant eelgrass and oyster beds in Sag Harbor Cove, which has suffered from degraded water quality in recent years. “We want to improve the ecology and help deal with the water quality issues in the Sag Harbor Cove,” he said. Mr. Hollander said he also envisions a literary trail, perhaps in collaboration with Sag Harbor’s John Jermain Memorial Library, which would include references to Steinbeck’s work. Mr. Hollander said he works on many projects in the Hamptons where customers throw out perfectly good plantings, decking and garden materials, and he could procure those for the village at little cost. But first, the village has to acquire the property. Sag Harbor Mayor Sandra Schroeder said she “cannot comment on any development before the planning board” when asked about the status of the possible acquisition. She added that real estate transfers inside Sag Harbor Village have generated millions of dollars to Southampton Town’s Community Preservation Fund, while very few properties inside the village have been preserved through the CPF. Ms. Schroeder did say she’d appreciate community support for the project. “Letters of support would be wonderful,” she said.